A tiny pilotless aircraft, built by the University of Southampton, has launched from the Royal Navy's ice patrol ship HMS Protector for the first time to assist with navigating through the Antarctic. 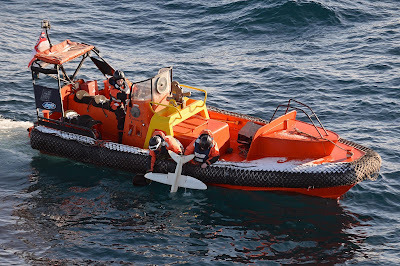 The 3D-printed aircraft, along with a quad-copter, scouted the way for the survey ship so she could find her way through the thick ice of frozen seas. It's the first time the Royal Navy has used unmanned aerial vehicles in this part of the world. The Service has been operating ScanEagle 'eyes in sky' from frigates in the Gulf for the past couple of years, which feed vital live imagery back to ships on maritime security patrols. The craft launched from Protector are smaller and less hi-tech, but still provided the icebreaker with real-time high-quality information courtesy of a detailed picture of the surrounding environment from a perspective that is only available from the air. The quad-copter was used for short-range reconnaissance missions, while the 3D-printed mini aircraft was sent off on longer patrols. Developed by experts at the University of Southampton University, the Laser-Sintered Aircraft -- shortened to SULSA -- is made of nylon, printed in four major parts and assembled without the use of any tools -- it is the world's first 'printed' airplane. It is controlled from a laptop on board, cruises at nearly 60mph and is all but noiseless thanks to its tiny engine. Each one costs no more than £7,000 (6,62,604 INR) -- cheaper than an hour's flying time by a Fleet Air Arm helicopter. Having been tested off the Dorset coast last summer with HMS Mersey, the 3kg aircraft was given a much more rigorous work-out over Antarctica. After flights of up to 30 minutes' duration it was fished out of the icy waters by one of HMS Protector's boats so it could be launched once more. Dramatic video footage of the Antarctic seas was captured and the aircraft was safely and reliably operated under the supervision of Andrew Lock, from the University's Computational Engineering and Design research group. "This trial of these low-cost but highly versatile aircraft has been an important first step in establishing the utility of unmanned aerial vehicles in this region," said Captain Rory Bryan, Protector's Commanding Officer. "It's demonstrated to me that this is a capability that I can use to great effect." 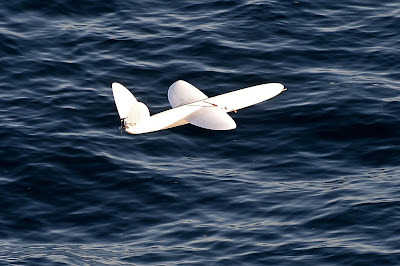 Andy Keane, Professor of Computational Engineering at the University of Southampton, said: "The series of flights conducted by Southampton staff in conjunction with the Royal Navy from HMS Protector has been a great success. These flights have shown just what can be achieved with smart design and low cost digital manufacture." The results of Protector's trial have been fed back to Royal Navy headquarters in Portsmouth, 700X Squadron in Culdrose -- the Navy's dedicated unmanned aircraft unit -- and the Maritime Warfare Centre at HMS Collingwood. "I am delighted with the successful deployment of small unmanned aerial vehicles from HMS Protector in the Antarctic," said Commodore James Morley, the Navy's Assistant Chief of Staff Maritime Capability. 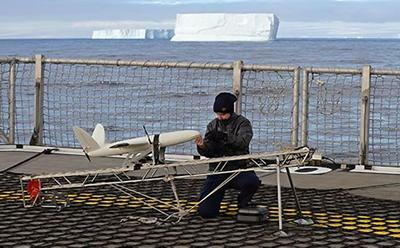 "The whole team has overcome significant hurdles to demonstrate the enormous utility of these aircraft for affordable and persistent surveillance and reconnaissance from ships -- even in the environmentally challenging environment of the Antarctic. "Although this was a relatively short duration trial to measure the relative merits of fixed and rotary wing embarked systems, we are continuing to review our options for acquisition of maritime unmanned aerial vehicles in the future." The above post is reprinted from materials provided by University of Southampton.